Saw III is a 2006 American horror film directed by Darren Lynn Bousman from a screenplay by Leigh Whannell and story by James Wan and Leigh Whannell. It is the third installment in the Saw franchise and stars Tobin Bell, Shawnee Smith, Angus Macfadyen, Bahar Soomekh, and Dina Meyer. The story follows Jeff, a man who, after his son is killed by a drunk driver, is put through a series of tests by Jigsaw in order to try to get him to let go of his vengeance for the man that killed his son. Meanwhile, a bed-ridden John Kramer has his apprentice Amanda Young kidnap Jeff's wife, Lynn, who is tasked with keeping John alive for one final test before he dies. Development began right after the successful opening weekend of Saw II. Filming took place in Toronto from May to June 2006. Whannell aimed to make the story more emotional than previous installments, particularly with the Amanda and Jigsaw storyline. The film is dedicated to producer Gregg Hoffman who died on December 4, 2005. Saw III was released on October 27, 2006, and was a financial success, opening to $33.6 million and grossing $80.2 million in the United States and Canada. It is the highest-grossing film of the series in the international market with $84.6 million and the highest-grossing film in the series with $164.8 million worldwide. It received mixed to negative reviews from critics. Bell was nominated for "Best Villain" at the 2007 MTV Movie Awards and the film received nominations for a Saturn Award as "Best Horror Film". The film was released to DVD and Blu-ray on January 23, 2007, and topped the charts selling 2.5 million units in its first week. After being left in the bathroom to die, Detective Eric Matthews breaks his foot with a toilet lid to escape his shackle. Six months later, the aftermath of a Jigsaw "game" is discovered by a SWAT team. The victim, Troy, was meant to rip chains from his body in order to escape from a bomb. Detective Allison Kerry arrives at the scene, and points out that the room's exit was welded shut, breaking Jigsaw's modus operandi of giving his victims a chance to survive. While reviewing the videotape, she is abducted and awakens in a harness hooked into her ribs. Even though she retrieves the key from a beaker of acid and unlocks the harness, she is unable to remove it and is killed when time runs out. Dr. Lynn Denlon is abducted from the hospital where she works, and brought to the bedridden John Kramer. His apprentice, Amanda Young, locks a shotgun collar around Lynn's neck that is connected to John's heart rate monitor, and will detonate if John dies or Lynn moves out of range. She is instructed by Amanda to keep him alive until another victim has completed his game. The other victim, Jeff, wakes up in a box and learns that he must undergo tests, which will lead him to the man who killed his son Dylan in a drunk driving accident. Jeff became unstable and vengeful as a result and now neglects his daughter, Corbett. Jeff's first test leads him into a meat freezer. He finds Danica Scott, the only witness to the accident, who refused to testify in court; she is stripped naked and chained at the wrists between two poles, which begin spraying her with ice-cold water. Jeff attempts to reach the key, which is behind frozen bars after Danica persuades Jeff to help her, but she freezes to death before he can retrieve it. In his next test, Judge Halden, who gave Dylan's killer six months in jail, is chained at the neck to the bottom of a pit. Rotted pig corpses are dropped into a rack of circular saws, slowly filling the vat, but Halden persuades Jeff to help him. Jeff sets fire to a cage full of Dylan's toys in order to retrieve the key, and save Halden before he drowns. His third test involves Timothy Young, Dylan's killer, who is strapped to a machine called the rack that will twist his limbs and neck until they break. The key is tied to the trigger of an enclosed shotgun. Jeff accidentally kills Halden when he takes the key, and is unable to stop the machine before Young's neck breaks. Meanwhile, Lynn is forced to perform an improvised surgery to relieve pressure on John's brain with a conventional drill, not a cranial drill that is normally used for delicate surgical procedures. Over the course of time, Amanda grows increasingly jealous of Lynn's interaction with John, who continues to reprimand her for being rude. It is only when John suffers a seizure that Amanda is willing to cooperate with Lynn. During the surgery, John hallucinates about another woman and declares his love out loud. This upsets Amanda and when she leaves, she finds a letter which drives her to hysterics. Amanda returns with the news that Jeff has completed his tests, but refuses to remove Lynn's collar. She reveals that she no longer believes in John's philosophy, and has been creating inescapable traps. She also reveals that she fought with Detective Matthews after he escaped the bathroom, and left him for dead. Refusing to listen to John's warnings, Amanda shoots Lynn just as Jeff arrives. The latter, who is revealed to be Lynn's husband, retaliates by shooting Amanda with a gun provided by John after his tests. As Amanda dies, John reveals that Lynn's test was actually hers: aware of her modus operandi, and unwilling to allow a murderer to continue his legacy John decided to test her. John then addresses Jeff, offering to call an ambulance for Lynn if he accepts one last test: he can choose to kill John or forgive him. Jeff tells John he forgives him, but slashes his throat with a power saw. The door to the room seals as John plays a final tape, which tells Jeff that he has failed his final test by killing John, the only person who knows the whereabouts of his daughter. The tape ends as John dies, and Lynn's collar detonates as it kills her. Darren Lynn Bousman, director and co-writer of Saw II, James Wan, director of Saw, and Leigh Whannell, screenwriter on both, turned down the offer to make a third film in the franchise. Saw II producer Gregg Hoffman died a few weeks after its release. Bousman, Wan and Whannell got together to have lunch the day they heard of Hoffman's passing and decided to make Saw III in dedication to Hoffman. Whannell aimed to make Saw III more emotional, describing the plot as essentially a father-daughter "love story" between Jigsaw and Amanda. Wan (left) and Whannell (right) returned to write Saw III and also served as executive producers. Bousman said they did not intend to have a twist ending, as distinctly as the previous films, noting that "I think most people will figure it out in the first 15 minutes of the film". Whannell added, "What Darren and I struck for Saw III was to have an emotionally impactful ending." As with the previous two films, the ending was only given to the actors who appeared in the final scene at the time it was filmed. At one point the script was stolen from Bousman's chair; however, it was returned before it was leaked online. Soomekh became close with Lionsgate after appearing in their film Crash (2004) and they wanted her in their next big film. Not a fan of horror films she found the role challenging. "I had nightmares the first month I was on set. ", she said. Saw III was given a larger budget of $10 million, compared to Saw II's $4 million. Principal photography took place for 27 days at Toronto's Cinespace Film Studios from May 8, 2006, to late June. Production borrowed the bathroom set used in Scary Movie 4, which parodied the franchise. Almost all the transitions from one place to another were not made using digital effects; the transitions were shot on the spot. For example, when the camera moves from Troy's crime scene to Kerry being in the bathtub, Meyer had to run, take off all her clothes, and jump into the tub. Visually the film is akin to the previous two with using quick cuts and fast-paced rhythms. Bousman said, "We're using a lot of whip pans and flash frames to create a dynamic feel". Post-production services were provided by Deluxe. Bousman described the hardest scene to film was the "Pig Scene", explaining that they had to rush and it involved filming "so many moving parts". The pig carcasses were made out of foam, rubber and latex. The pig props had live disinfected maggots attached with honey. For "The Rack Trap", Whannell originally conceived it as a trap that would fold a person into a box, though it eventually morphed into the twisting of body parts. Bousman wanted to have a trap that involved freezing someone to death since the films had already touched on burning to death, bleeding to death and being cut to death. A body cast was made of Debra Lynn McCabe for "The Freezer Room" trap, but because of safety regulations a person cannot be entombed, so only a front or back body cast could be on the actress at any given time. For bathroom trap the "Classroom Trap", J. Larose's character was originally going to be hanged from the ceiling by meat hooks, but it was decided against since he would not have been able to rip the chains out himself (as the script called for). It proved to be a challenge since it was done with prosthetics and practical effects. Saw III was released domestically and in the United Kingdom on October 27, 2006. It was released in Australia on November 2, 2006, and on January 4, 2007, in New Zealand. According to executive producer Daniel Heffner, the film was toned down seven times to obtain the "R" rating. According to Bousman, the Motion Picture Association of America (MPAA) ratings board was less concerned with the film's graphic violence than it was with emotional torture, citing television shows like CSI for expanding the scope of what is acceptable. In Japan, Saw III received a R18+ rating while the previous two films received an R15+ rating. At screenings in the United Kingdom, five people were reported to have fainted at separate cinemas with three at one cinema, resulting in ambulances being called. The opening scene of Troy's trap was shown at San Diego Comic-Con International on July 21, 2006. The same clip was planned to be shown before the opening of Crank in theaters on September 1, 2006. However, the MPAA would not allow it. On October 10, 2006, Bell, Smith and Bousman appeared at Spike TV's Scream Awards to promote the film and the clip of Troy's trap was shown. Lionsgate's president of theatrical marketing Tim Palen thought of the idea to make 1,000 posters with a small amount of Bell's blood, which was mixed with the printing ink. He said, "I asked if it would be possible to use actual blood. There was silence. He said, 'We could try, but are you serious?' I said I was dead serious." The posters were sold for $20, with the first being auctioned off; all the proceeds from the auctioned poster were donated to the Red Cross. Lionsgate also held the third annual "Give Til It Hurts" blood drive for the Red Cross and collected 23,493 pints of blood. The soundtrack was released on October 24, 2006. James Christopher Monger of AllMusic gave the soundtrack three out of five stars. Ed Thompson of IGN Music gave it a 7.2 out of 10. Saw III was released to DVD and Blu-ray through Lionsgate Home Entertainment on January 23, 2007. It topped the home video charts in the United States and Canada with 1.6 million units sold its first day and finished the week with 2.5 million units sold. The "Unrated DVD" was also released that day and features a 113-minute cut of the film that includes more gore. A 120-minute-long Director's cut was released on October 23, 2007, to coincide with the theatrical release of Saw IV on October 26. It also included an alternate ending. The director's cut was released on Blu-ray in Region B on October 7, 2008, in France only. The original cut of the film ran for slightly over two hours, and several scenes were cut out, including a scene which depicted an extended scene of Kerry and Rigg examining Troy's trap, where Kerry reveals to Rigg she has had nightmares about Eric, and she blames herself for what happened to him. Adam had more scenes in the original cut. A scene that showed Jigsaw regretting his actions was also cut. Bell said, "I'm glad they cut that scene. This guy knows exactly what he's doing. Does he start off with a model, then refine it? Yeah, he probably does. But there are certain things that are interesting and advance the story, and there are other things that are basically sort of backstory, and you don't really need to know". Saw III opened at number one on 4,700 screens at 3,167 theaters grossing $33.6 million from its opening weekend, a two percent increase from Saw II's $31.7 million. It held the biggest Halloween weekend debut for five years until it was beaten in 2011 by Puss in Boots ($34 million). It was also Lionsgate's highest-opening weekend. Lionsgate's exit polling indicated that 69 percent of the audience was under 25 years old and 51 percent was male. In its second weekend it placed number four, dropping down 56% to $14.8 million, compared to Saw II's second weekend drop of 47% to $16.9 million. The film was closed out of theaters on December 14, 2006, after 49 days of release. Saw III opened at number five in the international market with an estimated $6 million. It opened at number one in the United Kingdom to $4.7 million. In Taiwan it placed third and opened to $320,000. For its second weekend it opened to number two with an estimated $9.7 million. In Spain it made $3.1 million, an improvement over the previous films. For its third weekend, Saw III grossed $8 million, including Japan's opening on 86 screens with $1.1 million. Australia made $4.3 million, Spain grossed $3.8 million and Brazil made $3.8 million. In its fourth weekend it placed fourth place with an estimated $5.6 million from 24 territories. Its best market was a second-place start in France. The film took $80.2 million in the United States and Canada and $84.6 million in other territories, for a worldwide total of $164.8 million. 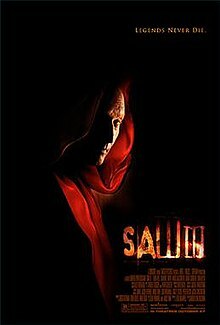 Saw III has the highest-grossing weekend in the series, holds the records of highest-grossing in the international market and is the second highest-grossing film in the series worldwide. It is also Lionsgate's fifth highest-grossing film in the United States and Canada. The film was not screened in advance for critics. Review aggregator Rotten Tomatoes gives the film a score of 28% based on reviews from 90 critics, and a rating average of 4.2 out of 10. The Rotten Tomatoes consensus states: "Saw III does little beyond repeating its predecessor's tropes on a gorier level." At Metacritic, which assigns a weighted average score out of 100 to reviews from mainstream critics, the film received an average score of 48 based on 16 reviews, indicating "mixed or average reviews". CinemaScore polls reported that the average grade moviegoers gave the film was a "B" on an A+ to F scale. Variety's Robert Koehler gave the film a mixed review. He criticized the use of several flashbacks in the film, saying that it "[...] hinder[ed] the movie, ratcheting down its tension and pace". He explained, "A bigger problem lies with Leigh Whannell's script, which utilizes so many flashbacks and explanatory inserts that the tension, a defining feature of the first Saw, is lost". He did, however praise the acting. Roger Moore of the Orlando Sentinel gave it two out of five stars, criticizing the plot and acting. The San Francisco Chronicle's Peter Hartlaub gave the film a negative review, criticizing the plot. Michael Ordoña of the Los Angeles Times said that "More gore is really all Saw III has to offer", Owen Gleiberman of Entertainment Weekly gave the film a "C". Randy Cordova of The Arizona Republic gave it a negative review saying, "Saw III is devoid of any suspense or terror". Empire's Kim Newman gave the film two out of five stars. He said the acting was "surprisingly good" but criticized the script and torture devices. Saw III was nominated for a Saturn Award for Best Horror Film, but lost to The Descent. It was also nominated as the "Choice Movie: Horror/Thriller" at the Teen Choice Awards, but lost to Disturbia. Bell was nominated for a MTV Movie Award for Best Villain, but lost to Jack Nicholson for his role in The Departed. ^ "Saw III (2006)". American Film Institute Catalog. Retrieved December 3, 2017. ^ Koehler, Robert. "Saw III - Review". Variety. Variety. Retrieved December 3, 2017. ^ "Saw III (18)". British Board of Film Classification. October 11, 2006. Retrieved September 3, 2016. ^ a b "Saw III (2006)". British Film Institute. Retrieved December 3, 2017. ^ "Saw III". The Numbers. ^ a b c d e "Saw III (2006)". Box Office Mojo. Amazon.com. Retrieved October 29, 2006. ^ a b Douglas, Edward (October 24, 2006). "Exclusive: Saw III's Darren Lynn Bousman". ComingSoon.net. CraveOnline. Archived from the original on September 13, 2011. Retrieved September 12, 2011. ^ a b c Topel, Fred (October 27, 2006). "Interview Bousman & Whannell". Joblo.com. Archived from the original on September 14, 2011. Retrieved September 14, 2011. ^ "Interview: Bahar Soomekh and Angus Macfadyen". IGN. News Corporation. October 27, 2006. p. 1. Archived from the original on September 15, 2011. Retrieved September 14, 2011. ^ Alexander, Chris (June 11, 2006). "Saw's Unkindest Cutssaw's Unkindest Cuts". Toronto Star. Torstar. ^ Rooney, Brian (October 27, 2006). "Evolution of Scary Movies". ABC News. Archived from the original on August 22, 2011. Retrieved August 22, 2011. ^ Rowe, Michael (October 2006). "SAW III: Deadlier Lessons". Fangoria (257): 30. ISSN 0164-2111. ^ "Lionsgate and Twisted Pictures Rip Into SAW III as Latest Film in Powerhouse Horror Franchise Starts Principal Photography in Toronto". PR Newswire. May 6, 2006. Archived from the original on September 13, 2011. Retrieved August 19, 2011. ^ a b "Saw III Production Notes" (PDF). Lionsgate. Archived from the original (PDF) on September 18, 2011. Retrieved September 18, 2011. ^ "EXCLUSIVE: Saw III's Director Darren Lynn Bousman". MovieWeb. October 26, 2006. Archived from the original on September 15, 2011. Retrieved September 14, 2011. ^ "Saw III (2006)". The Numbers. Nash Information Services, LLC. Retrieved December 15, 2017. ^ "Saw III (2006) International Box Office Results". Box Office Mojo. Amazon.com. Retrieved September 18, 2011. ^ "Interview: Darren Bousman". Joblo.com. June 19, 2007. Archived from the original on September 13, 2011. Retrieved September 12, 2011. ^ Bousman, Darren Lynn (October 11, 2006). "SAW III: The Darren Lynn Bousman Blog Only on B-D!". Bloody Disgusting. The Collective. Archived from the original on September 13, 2011. Retrieved September 12, 2011. ^ "Film fans faint at Saw III show". BBC News. October 31, 2006. Archived from the original on September 13, 2011. Retrieved October 21, 2006. ^ "Comic-Con 2006: Saw III Cuts Loose". IGN. News Corperotion. July 21, 2006. Archived from the original on September 15, 2011. Retrieved September 14, 2011. ^ Sciretta, Peter (October 12, 2006). "Banned SAW 3 clip Revealed". /Film. Archived from the original on September 13, 2011. Retrieved September 13, 2011. ^ Condit, Jon (September 29, 2006). "Scream For Spike TV's Awards". DreadCentral. CraveOnline. Archived from the original on September 13, 2011. Retrieved September 13, 2011. ^ McClintock, Pamela (October 9, 2006). "Inside Move: 'Saw' gets into bloody vein for promo poster". Variety. Reed Business Information. Archived from the original on September 12, 2011. Retrieved September 12, 2011. ^ "American Red Cross Partners With Lionsgate on SAW IV Blood Drive". Red Cross. August 6, 2007. Archived from the original on September 13, 2011. Retrieved September 12, 2011. ^ Monger, James Christopher. "Saw 3 Original Soundtrack". Allmusic. Rovi Corporation. Retrieved September 13, 2011. ^ "An album teeming with solid cuts". IGN. News Corporation. October 27, 2006. Archived from the original on September 14, 2011. Retrieved September 14, 2011. ^ a b "Lionsgate and Twisted Pictures' SAW III 'Three-Peats' at Number One on DVD Charts While Also Claiming Most Successful Week One Blu-Ray Debut to Date". CNW Group. February 1, 2007. ^ "Uber-Bloody 'Saw III: Director's Cut' This October, Box Set!". Bloody Disgusting. The Collective. August 6, 2007. Archived from the original on September 13, 2011. Retrieved September 13, 2011. ^ "Saw 3 [Blu-ray] [Director's Cut Extreme]". Amazon. Retrieved December 16, 2017. ^ "IGN: Interview: Darren Lynn Bousman". IGN. News Corporation. October 26, 2007. Archived from the original on September 13, 2011. Retrieved October 26, 2007. ^ Heisler, Steve (October 29, 2008). "Tobin Bell Random Roles". The A.V. Club. The Onion. Archived from the original on October 18, 2011. Retrieved October 17, 2010. ^ Porter, Rick (October 30, 2011). "'Puss in Boots' sets Halloween box-office record (for now)". Zap2it. Archived from the original on October 30, 2011. Retrieved October 30, 2011. ^ Gray, Brandon (November 6, 2006). "'Borat' Bombards the Top Spot". Box Office Mojo. Amazon.com. Retrieved September 12, 2011. ^ Bresnan, Conor (October 30, 2006). "Around the World Roundup: 'Prada' Still in Vogue". Box Office Mojo. Amazon.com. Retrieved September 13, 2011. ^ Bresnan, Conor (November 13, 2006). "Around the World Roundup: 'Borat' Doesn't Budge". Box Office Mojo. Amazon.com. Retrieved September 13, 2011. ^ Bresnan, Conor (November 20, 2006). "Around the World Roundup: 'Casino' Cashes In". Box Office Mojo. Amazon.com. Retrieved September 13, 2011. ^ Bresnan, Conor (November 27, 2006). "Around the World Roundup: 'Royale' Flush in Second Weekend". Box Office Mojo. Amazon.com. Retrieved September 13, 2011. ^ "'Saw' Vs. 'Saw'". Box Office Mojo. Amazon.com. Retrieved August 19, 2011. ^ "Lionsgate All Time Box Office Results". Box Office Mojo. Amazon.com. Retrieved September 19, 2011. ^ a b Cordova, Randy (November 3, 2006). "Saw III". The Arizona Republic. Gannett Company. Archived from the original on September 14, 2011. Retrieved September 13, 2011. ^ "Saw III (2006)". Rotten Tomatoes. Flixster. Retrieved September 12, 2011. ^ "Saw III Reviews". Metacritic. CBS Interactive. Retrieved September 12, 2011. ^ Rich, Joshua (October 29, 2006). "'Saw' Conquers". Entertainment Weekly. Time Inc. Archived from the original on September 13, 2011. Retrieved September 13, 2011. ^ Koehler, Robert (October 27, 2006). "Saw III Review". Variety. Reed Business Information. Archived from the original on September 14, 2011. Retrieved September 13, 2011. ^ Moore, Roger (October 27, 2006). "Saw III (2 stars out of 5)". Orlando Sentinel. Tribune Company. Archived from the original on September 14, 2011. Retrieved September 13, 2011. ^ Hartlaub, Peter (October 30, 2006). "Bedridden Jigsaw's minion carries on killing in 'Saw III'". San Francisco Chronicle. Tribune Company. Archived from the original on September 14, 2011. Retrieved September 13, 2011. ^ Ordoña, Michael (October 30, 2006). "This new horror sequel little more than a hack". Los Angeles Times. Tribune Company. Archived from the original on September 14, 2011. Retrieved September 13, 2011. ^ Gleiberman, Owen (November 1, 2006). "Saw III Review". Entertainment Weekly. Time Inc. Archived from the original on September 13, 2011. Retrieved September 13, 2011. ^ Newman, Kim (November 29, 2006). "Saw III Movie Review". Empire. Bauer Media Group. Archived from the original on September 19, 2011. Retrieved September 19, 2011. ^ Brattelli, Adrian (February 21, 2007). "The 33rd Annual Saturn Awards Nominations Announced!". Fearnet. Archived from the original on September 20, 2011. Retrieved September 20, 2011. ^ Miska, Brad (May 11, 2007). "33rd Annual Saturn Awards Winners Announced!". Bloody Disgusting. Archived from the original on September 20, 2011. Retrieved September 20, 2011. ^ Weinberg, Scott (August 27, 2007). "2007 Teen Choice Awards: The Shocking Results". Moviefone. AOL. Archived from the original on September 20, 2011. Retrieved September 20, 2011. ^ Carroll, Larry (June 14, 2006). "Man Behind Jigsaw Swears 'Saw' Killer Is Back For Third Bloodbath". MTV.com. Archived from the original on September 20, 2011. Retrieved September 20, 2011. ^ "2007 Movie Awards Summary". MTV.com. June 3, 2006. Archived from the original on September 20, 2011. Retrieved September 20, 2011. This page was last edited on 16 April 2019, at 07:48 (UTC).